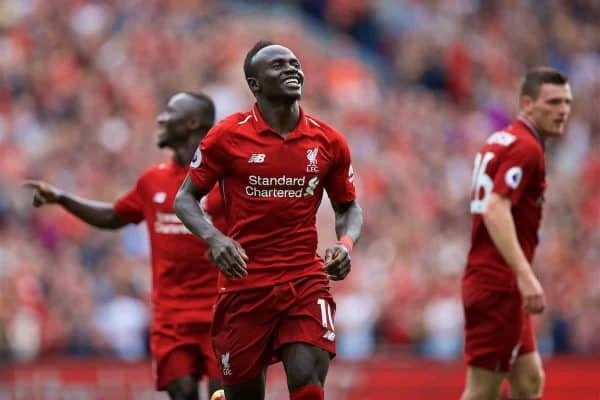 Sadio Mane has started the 2018-19 season in outstanding form and he looks primed for the best season of his career so far. The decision to swap No.19 for the iconic No.10—left vacant following Philippe Coutinho’s move to Barcelona in January—was more than just a simple change of shirt numbers for Mane this summer. It reflects the growth of his reputation at Liverpool into a talismanic figure, a player ready to step up and take on a new level of responsibility. He appears more confident than ever before, totally at ease with the expectations facing him and his teammates this season, relishing the spotlight and the opportunity to build on Liverpool’s upward trajectory in recent seasons. Mane himself, of course, has been an integral part of that. It isn’t just his goals and assists which stand out, though. His all-round performances throughout the calendar year have been exceptional, varying his position between drifting infield and hugging the touchline, constantly making himself available for the ball and ensuring he is right at the heart of Liverpool’s flowing attacking moves. It may only be early days this season, but Mane is clearly ready to take his game up another notch, and truly establish his status as a genuine, world-class footballer. 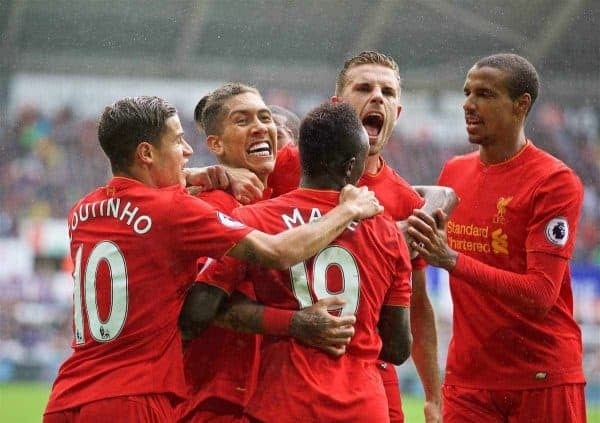 The most underrated of Liverpool’s front three? Mohamed Salah and Roberto Firmino stole the limelight for much of last season, hitting a remarkable 44 and 27 goals respectively. While Mane had previously been named Liverpool’s Player of the Year in his first season at the club, Salah’s arrival overshadowed Mane’s brilliance to a certain extent. When he first joined from Southampton in the summer of 2016, Mane’s arrival was met with scepticism from some quarters regarding his £34m price tag and whether he would have the level of consistency required to cut it at a club of Liverpool’s stature. A stunning solo goal on his debut against Arsenal in a 4-3 win on the opening day of the 2016-17 season immediately quelled any lingering doubts, however. From then on, Mane quickly went on to establish himself as Liverpool’s most important player that season, bringing a whole new dynamic to Jurgen Klopp’s front line. Operating on the right of the front three, Mane’s searing pace, direct style of play and ability to arrive in goalscoring positions transformed Liverpool’s attack. An injury sustained in the Merseyside derby, which ruled him out of the season run-in, left Liverpool looking severely blunt in his absence; they only just managed to haul themselves across the finish line to secure a top-four spot on the final day. Salah’s arrival meant Mane was then shifted out to the left-hand side, and his status as Liverpool’s most influential attacking player was taken by the Egyptian’s sensational debut campaign. The red card against Manchester City proved a heavy blow for Mane, and his form noticeably dipped for several months following that sending off. 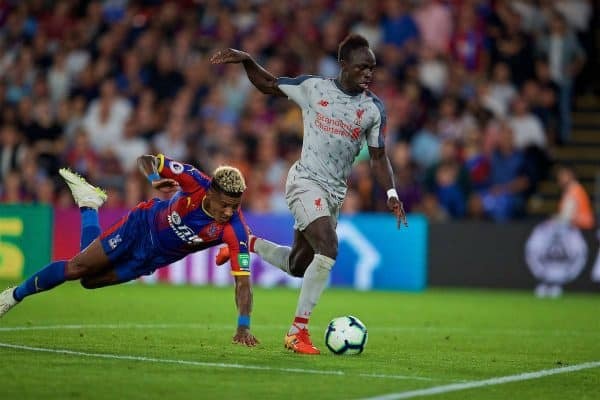 Mane was still returning decent numbers in terms of goals and assists, but he had lost the confidence to take players on and his first-touch and decision-making became highly erratic. Failing to square the ball in the 1-1 draw against Everton at Anfield and choosing to go for goal himself—badly missing the target—proved a further knock to Mane’s confidence. 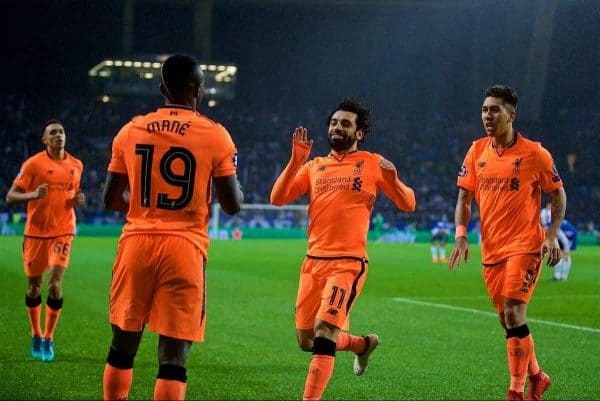 Throughout the second half of the campaign, however, Mane regained his mojo, scoring a Champions League hat-trick against Porto which proved to be a turning point in his season. He went on to reassert his brilliance and finished the campaign in excellent form, scoring in both legs of the Champions League semi-final against Roma, as well as the equaliser in Kyiv against Real Madrid. His role evolved as he began to take up more central, deeper positions, showcasing his exceptional creativity and intelligence as a quasi-No.10, drifting in off the flank to dictate Liverpool’s attacks and bring a new element of variety and unpredictability to his game. The fact that Salah and Firmino enjoyed such outstanding seasons meant that Mane went slightly under the radar, and his role in the side somewhat understated. All this, despite still racking up a highly impressive 20 goals and eight assists himself across all competitions, many of which came at crucial, decisive moments in games. If he continues to deliver at his current level, however, that will not remain the case for much longer. How many could he score this season? Out of Liverpool’s exceptional attacking trio, Mane is certainly the one with the most scope for individual improvement in terms of his goals and assists output. After upping his tally from 13 in his debut season at the club to 20 last time out, there’s every reason to believe Mane could make a similar improvement this term. Especially since he has already bagged three goals in the opening two games. 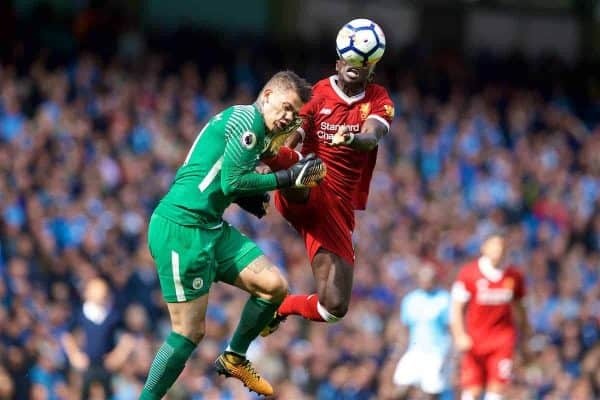 A combination of injury and the red card against City heavily disrupted Mane’s confidence and rhythm throughout the first half of last season. Having got himself off to a flying start this time around, continuing to perform at this level will go some distance to not only boosting his personal tally, but also ensuring Liverpool pick up more points in the first half of the season. Ultimately, that is where they fell behind the leaders last season. Although Mane’s performances in the Champions League were particularly eye-catching, his total tally of 20 goals saw them split exactly half-and-half between Europe and the Premier League. 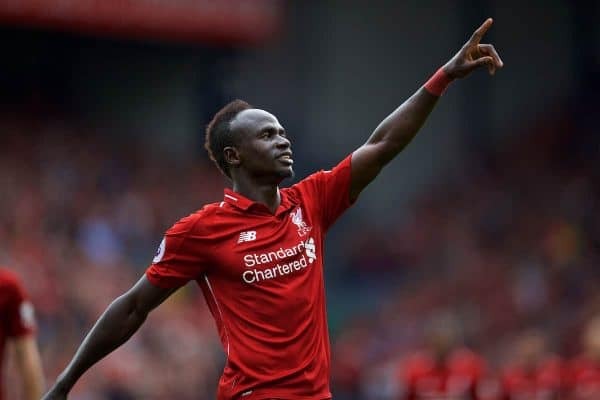 For a player of his ability, Mane is certainly capable of scoring more than 10 in the league this season and, if he can push himself closer to the 20-goal mark, that could be a decisive factor in helping Liverpool close the gap on City at the top. 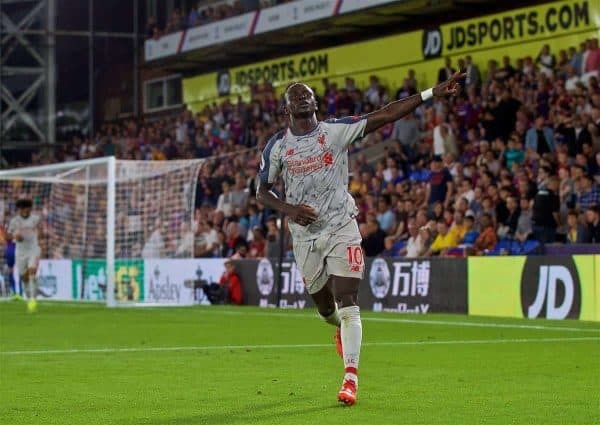 Indeed, Mane has now racked up 14 goals in his last 19 appearances for Liverpool stretching back to last season, which equates to a ratio of 0.74 goals per game. Extrapolate that goalscoring rate over a full Premier League season and Mane would be hitting 28 league goals. The extremely high bar set by Salah’s remarkable return last season should also serve as a source of inspiration and motivation for Mane to achieve something similar himself. Of course, in reality, Mane won’t play every single league game this season, but fitness permitting, he will almost certainly start in at least 30, and the potential is there for him to double his league tally from last season. In all competitions, 30 should be considered a realistic target. If Mane was the standout performer in Liverpool’s emphatic opening day victory against West Ham, then new signing Naby Keita wasn’t far behind. He delivered a highly encouraging debut which offered a glimpse of what Liverpool can expect from their new No.8 this season. 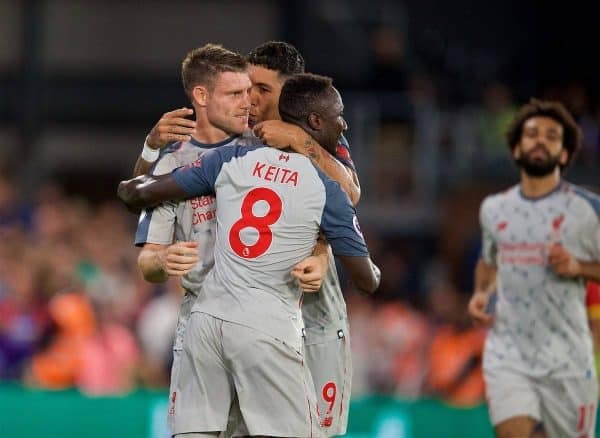 Keita followed that up with another excellent showing against Crystal Palace, especially in the first half. He might even have supplied one of the finest assists in recent memory: an audacious flick to evade an opponent on the edge of his own penalty area, before dinking a pinpoint 60-yard pass for Salah, who couldn’t quite add the finishing touch on this occasion. Both part of the same agency group, Arena 11, Mane played an important role in helping convince Keita to make the move from RB Leipzig to Merseyside. The two players developed a close friendship as former teammates together at RB Salzburg, living in the same part of the city during their brief time together in Austria. 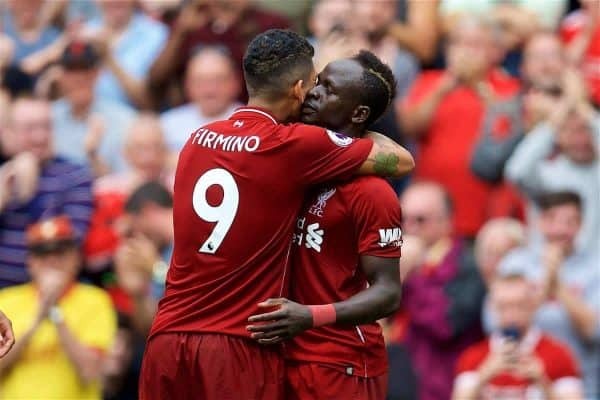 Both French-speaking, coming from neighbouring West African nations of Senegal and Guinea, Mane and Keita’s bond also has the potential to flourish on the pitch for Liverpool this season. 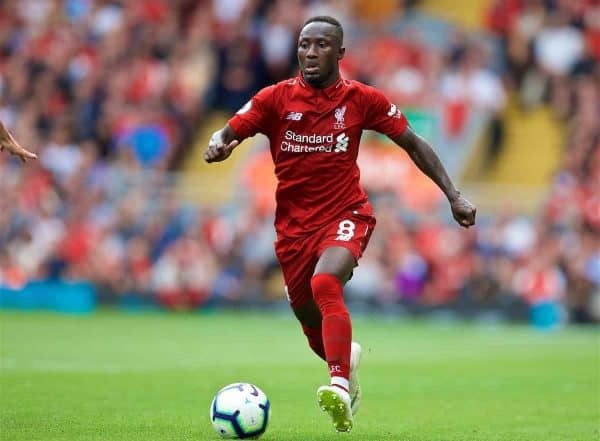 Throughout pre-season, and in Liverpool’s opening two league games, Keita frequently occupied the spaces between the opposition’s midfield and defence, picking up the ball between the lines and driving forward aggressively. This he did to great effect when playing his part in the build-up to Salah’s goal against West Ham, laying the ball off to Andy Robertson on the overlap. Keita’s direct style and ability to breeze past and commit opponents in central areas drags them out of shape, and therefore opens up more spaces for the likes of Mane and Salah to exploit in behind. Keita also has the vision and the technique to play incisive through balls to the forward players and will benefit greatly from the intelligent movement and diagonal runs made by Mane, infield from out wide. Klopp has also spoken about Keita’s versatility, enabling him to be effective out wide in certain situations. We have already seen a glimpse of that, with Keita drifting into wide-left positions at times against both West Ham and Palace. 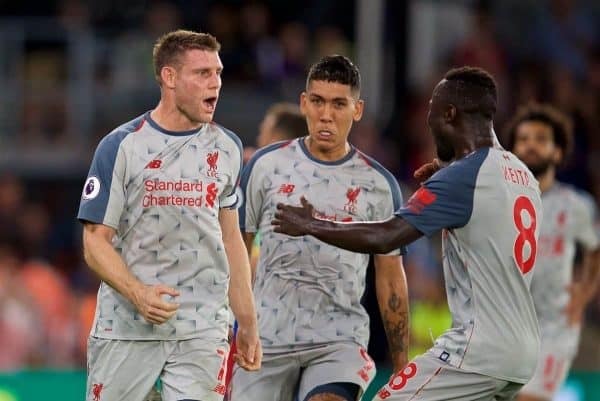 Developing a strong on-field understanding with Mane and Robertson on that side of the pitch will further enhance the effectiveness of Liverpool’s attacking moves—just as the combination of Salah, Trent Alexander-Arnold and James Milner has shown signs of working well down the right. 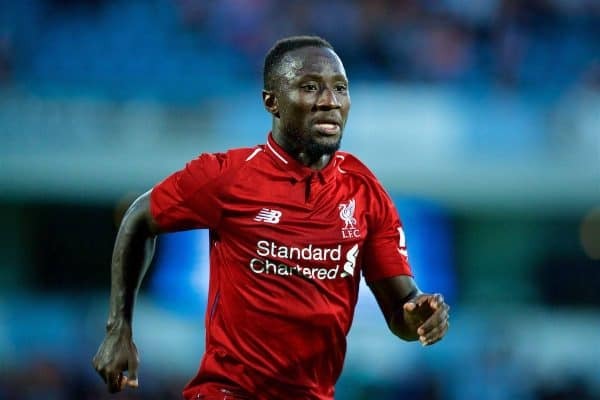 In Keita, Liverpool have a player who will not only elevate the midfield to a whole new level, but whose skill set and positional awareness can also dovetail excellently with Mane’s. Together, they can strike up a partnership which can help get the very best out of Liverpool’s No.10.